In the aerospace industry, ground testing of fuel systems and components is critical to insure flight worthiness. Engineers for these systems and components require valid data to insure that they completely understand the operation of the system or individual component under many environmental conditions. Turbine flowmeters are the choice when accuracy, range, dynamic response and changing environmental conditions are encountered. Jet turbine engine manufacturers use the FT Series flowmeter and Linear Link to measure fuel flow over a wide range (ex: 0.6 to 60 GPM) flow range. Data is typically required with the fuel at various temperatures and accuracy is critical. Turbine flowmeters are one of the most accurate flow sensors available today if used and calibrated properly. Remember that your flowmeter is only as good as it’s calibration. Turbine flowmeter accuracy is affected by the kinematic viscosity of the fluid being measured. For this reason, a calibration in fluid of the same kinematic viscosity is required to achieve the best accuracy. Because fluid kinematic viscosity changes due to temperature, multiple calibrations at different kinematic viscosities would be required. The Flow Technology Linear Link TCI product performs viscosity compensation techniques. Turbine flowmeters can use a technique referred to as a “Universal Viscosity Curve” to operate over varying kinematic viscosity values. This process involves calibrating the flowmeter over the viscosity range and using electronics to determine the correct flow rate based on the input temperature of the fluid and the frequency from the flowmeter. Limitations of this technique include calibrating the flowmeter at kinematic viscosity’s that do not vary by more than a 10:1 ratio from one another over the range of kinematic viscosity’s and limiting the range of the meter to a 10:1 turndown. Operation at extended ranges is possible; however accuracy of the output will degrade due to a drop off in flowmeter linearity when operated outside of the 10:1 normal flow range. 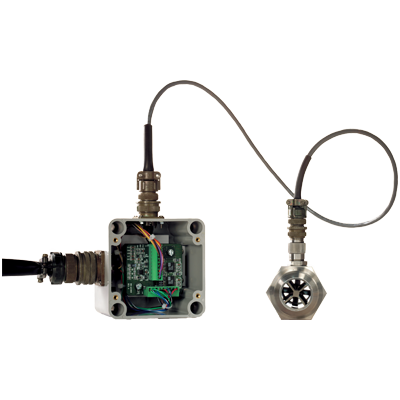 When data accuracy is critical over a wide temperature and flow range, the Linear Link is utilized. For instance, to address the wide temperature range, a customer determined that 5 discreet fluid temperatures were required for their data requirements. The solution for this requirement is to calibrate the flowmeter in fluids that match the kinematic viscosity’s of the fluid at the 5 different temperatures. To address the wide flow range required (100:1 turndown), linearization would be required to be performed by the flowmeter’s electronics. 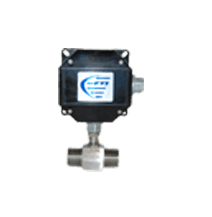 The Flow Technology Linear Link provides this capability and will insure the linearity of the flowmeter will meet a ± 0.1% reading specification over the 100:1 turndown. The Linear Link is provided with VisualLinK software that allows the customer to program the Linear Link with calibration data. For this application, data would be acquired with the fluid at a given temperature corresponding to one of the calibrations performed on the flowmeter. The fluid temperature would then be changed to the next value and additional data acquired. This requires that the calibration data for the next kinematic viscosity be loaded into the Linear Link electronics for the best possible accuracy. This is easily accomplished using the VisualLinK software and programming cable for the Linear Link.